Although the Macau VIP market growth is decelerating, we are sanguine about the Singaporean one. 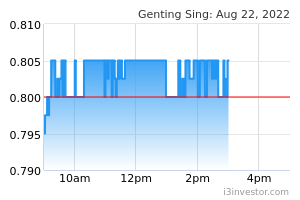 Yet, GENTING SINGAPORE LIMITED (SGX:G13) still trades at an attractive 6.8x FY19E EV/EBITDA or -1.5 SD to LT mean and only 11.0x FY19E ex-net cash PER. We roll forward our valuation to 9.0x FY19E EV/EBITDA (close to - 1SD to LT mean of 8.5x) from 10.0x FY18E EV/EBITDA (5-year mean) leading to a trimmed Target Price by 2% to SGD1.26. Key 2019 lookouts are Resort World Sentosa (RWS) rejuvenation plans and potential expansion into Japan. Macau VIP GGR has been easing y-o-y since Sep 2018 due to the decelerating Chinese economy (See Fig1 in the PDF report attached). Still, there are concerns that the easing will continue in 2019 due to the partial smoking ban on VIP gaming floors effective 1 Jan 2019.
it is not subject to a smoking ban. Our channel checks reveal that hitherto, RWS VIP volumes have not been as adversely affected as Macau’s and its mass market GGR have stabilised post the opening of Naga2 in Phnom Penh, Cambodia in Nov 2017. Both bode well for earnings stability. Thus, our earnings estimates are retained. Assuming 4Q18 RWS VIP win rate is within the theoretical range of 2.7-3.0%, we estimate that our FY18 EBITDA estimate of SGD1.2b and FY18 core net profit estimate of ~MYR800m will be met. In 1H19, Genting Singapore is expected to announce its RWS rejuvenation plan which we believe is part of the government sanctioned Greater Southern Waterfront project (link). We are not averse to the budgeted capex being revised upwards from the initial guidance of SGD1b over 3-4 years as long as it is value accretive. In 2H19/1H20, Japan will issue RFPs for three integrated resorts. We opine that Genting Singapore stands a good chance to win one thanks to its responsible gaming experience and solid net cash position.